Put half the jelly into a plastic measuring jug. Pour a little boiling water on the jelly and stir until it dissolves. Cut the oranges in half and scoop out the flesh and put it in the measuring jug. Add cold water up to the 250ml mark. Divide the jelly mixture between the 4 orange halves and leave to set. When the jelly is firm cut each piece in half. Cut the wafers in half diagonally and stick them in the top of the jellies. 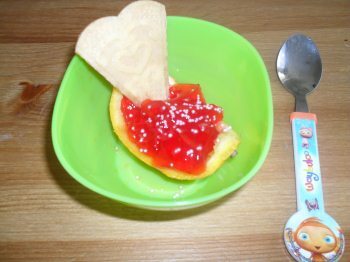 There you have it perfect little jelly dessert boats kids will love. You could add a little ice cream with this if your toddler likes. Also for a treat you could sprinkle some hundreds and thousands over the top. Why not print off a few of the toddler recipes you have found on this website that interest you and have go at making some of them. They are all simple to do and don't take a lot of time to cook. Like all things in life it's the getting the ingredients together before you can start that can take the time. So plan to make some of these next week and put what you need onto your shopping list. If you try any of our recipes out then please let us know what you think and how your little one enjoyed it or not as the case maybe. If you would like to add something new to this or other recipes then please feel free to do so.